Cydonia. Philip Miller. (For the town of Cydon in Crete.) QUINCE. Rosaceae. One species, a deciduous shrub or small tree, thornless, to 6m. Leaves to 10 x 6cm, alternate, ovate-elliptic, entire, deep green above, densely grey-tomentose and lanate beneath; stipules present, large, glandular-dentate; petiole to 1.5cm. Flowers solitary, terminal, 5cm diameter, white and dark-veined to soft pink; sepals 5, persistent; petals 5, rounded-obovate; stamens 20 or more, filaments free, glabrous, anthers cordate at base, dorsifixed, yellow; carpels 5, completely enclosed within the hypanthium; styles 5, distinct, derived from the swollen upper margin of the hypanthium; ovary inferior, 5-locular, each locule many-ovulate. Fruit a large, pyriform, many-seeded pome, light golden-yellow, finely tomentose, later glabrous, aromatic. Spring-summer. Western Asia. Z4. 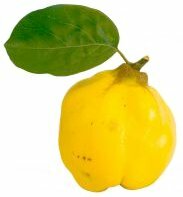 The quince, reputed to be the golden apple that Paris gave to Aphrodite, and with associations in folklore with marriage and fertility, is widely cultivated and naturalised throughout the Mediterranean, and in South America. The fruit, golden-yellow when completely ripe, has firm, strongly aromatic but somewhat gritty flesh, and is rich in pectin, making fine jellies and preserves. 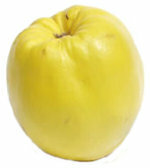 Quinces are also added to apple pies, or used in fruit soufflés, turning deep pink when cooked. In the Levant they are used as a spiced accompaniment with beef, chicken, game or lamb. They have been long used in herbal medicine, as an infusion to treat sore throat, diarrhoea and haemorrhage of the bowel. The seeds are poisonous, and should not be eaten. Cydonia is a beautiful and long-lived small specimen tree, bearing white or pale pink flowers in spring, attractive, downy, fragrant fruit, and having autumn foliage of rich yellow; with their crooked habit of growth they become increasingly picturesque with age. They grow well, planted near water. Cydonia is hardy in zones 4 to 7, but need warmth in summer to ripen fruits. When grown for fruit, Cydonia is treated as a bush or standard tree, with an open centre, or in less favourable areas, as a fan or espalier against a warm and sheltered south-facing wall. Cydonia oblonga provides a dwarfing rootstock for pears. Cydonia oblonga ‘Vranja’ and Cydonia oblonga ‘Bereczki’ are vigorous plants, and generous bearers of well-flavoured fruit, suited to fan-training. The fruit of Cydonia oblonga ‘Champion’, also a heavy cropper, and Cydonia oblonga ‘Portugal’ are milder in flavour. the variety ‘Maliformis’, with apple-shaped fruits, ripens well in colder climates. Grow in full sun, in deep, moist, fertile loam; on light soils apply an organic mulch to conserve water. Prune in winter to establish a fruiting framework, cutting back leaders by one third of the previous seasons growth, to an outward facing bud; fruit is carried on spurs and on the tips of the previous summers growth, and once the framework is established little pruning is needed other than to relieve overcrowding and remove badly placed branches. Harvest fruits when fully ripe, in mid to late autumn, unless there is a danger of frost. Store in a frost-free place apart from other fruits, which might otherwise be tainted by their strong aroma. Quince will keep for two to three months. Propagate by simple layering, stools, hardwood cuttings or by removal or suckers. Cultivars are also propagated by budding on to seedling Cydonia. Also by seed in autumn, where fruit quality is of little importance. Pests as for apples and pears. Cydonia may be affected by leaf blight, Entomosporium maculatum, and brown rot of the fruit; where necessary use a suitable fungicide in summer and repeat two to three weeks later. Rake up and burn fallen leaves in autumn. Also susceptible to fireblight; too hard pruning and excessive applications of fertiliser give rise to soft growth with increased susceptibility. 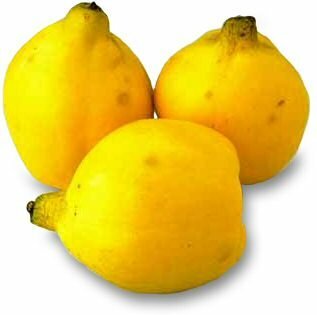 QUINCE; COMMON QUINCE. As for the genus. ‘Lusitanica’ PORTUGUESE QUINCE: flowers large, pale rose, abundant. Fruit 10 x 9cm, tapering to the stalk, deep-yellow, grey-languinose.